In our day-to-day lives, we don’t often encounter large amounts of cash. When we do, it’s usually in the form of a few hundred dollar bills. Even in the movies, large amounts of cash are represented by a suitcase stuffed with $100 dollar bills. That made me wonder: did higher denomination dollar bills even exist? Could the gangsters in the movies use a small envelope of $1000 dollar bills rather than a conspicuous briefcase? Is there a $1000 dollar bill? Yes, believe it or not, the $1000 dollar bill is real and is still considered legal tender. However, the chances of you stumbling onto one on accidentally is pretty slim. As of 2009, there were only around 165,000 known remaining thousand dollar bills. Most of those are in museums are in the hands of collectors. You’re probably wondering who had the (mis)fortune of being on the thousand dollar bill. Who is on the $1000 dollar bill? There are actually two people on the $1000 dollar bill. No, they’re not sharing a portrait. There are two people because there are two different $1000 dollar bills. Besides having a Broadway musical made about his life, Alexander Hamilton was the Founding Father who’s credited with founding the country’s financial system. Why Grover Cleveland? Well, he was our 22nd and 24th president. Did you notice what makes him special? He’s the only president (so far) to serve two non-consecutive terms. 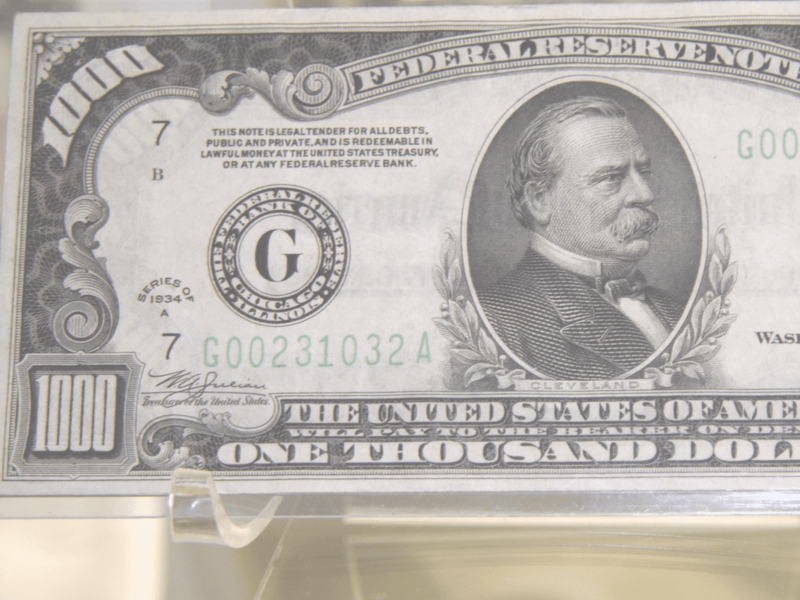 How much is a one thousand dollar bill worth? Interested in buying a $1000 dollar bill now? It won’t be easy. Finding a $1000 dollar bill for sale is pretty rare outside of the collectors market. 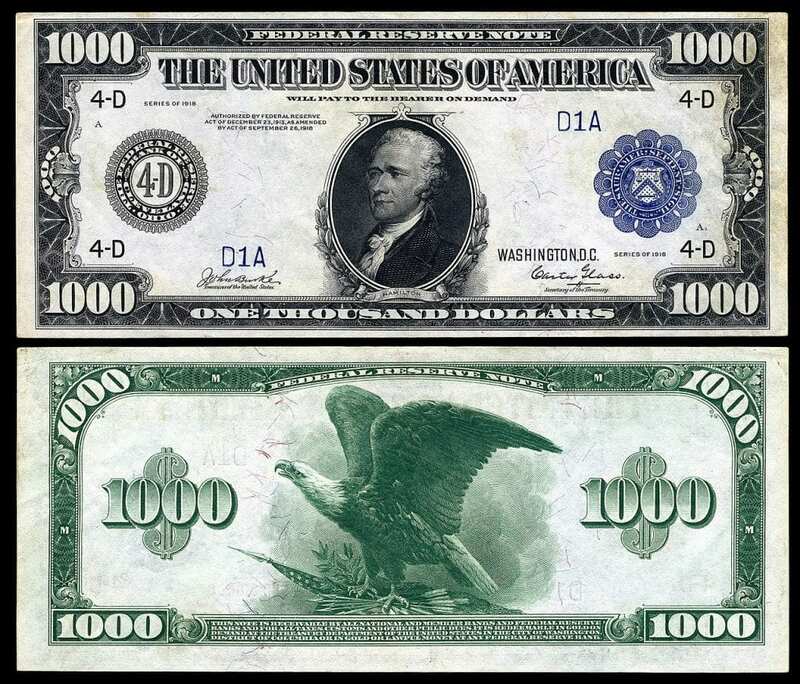 Even if you did find one, a thousand dollar bill is valued at much more than a thousand dollars now. Because of its rarity, you can normally buy one for upwards of $20,000. Which means, if you know of an elderly person with stacks of cash hidden away, you may want to help them go through it and check for rare bills. They could be sitting on a goldmine. Why aren’t $1000 dollar bills used anymore? 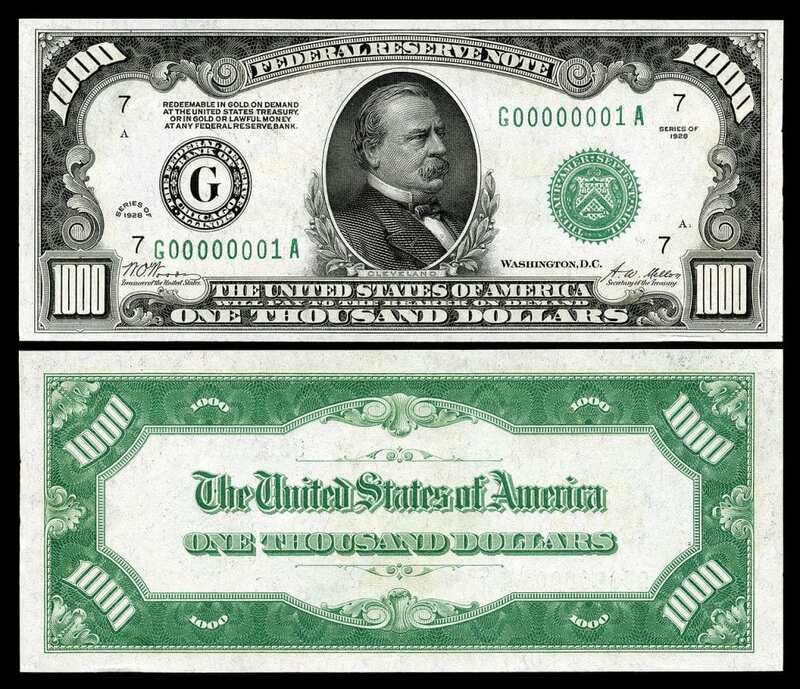 While they’re still legal tender, high-denomination bills like the $1000 dollar bill were last printed in 1945. Then, in 1969 the Federal Reserve officially discontinued them due to “lack of use”. Originally the purpose of high-denomination bills was to help banks and the federal government make large transactions. With the introduction of the electronic money system, the use of the bills disappeared. Along with the higher potential for counterfeiting and use for illegal activities, it’s very unlikely that high-denomination bills are ever going to come back into circulation. Another reason that the $1000 dollar bill was discontinued is that it wasn’t very cost efficient. In fact, it was cheaper to print a bunch of $1 bills to match the value of the $1000 dollar bill. Yes, a $1000 dollar bill exists and is still technically considered legal tender. It’s now worth much more than a thousand dollars because of how rare the note is. It’s valued at upwards of $20,000. Alexander Hamilton’s and Grover Cleveland’s faces grace the two different $1000 dollar bill series. Did you know there exists a $500 dollar bill, a $5,000 dollar bill, a $10,000 dollar bill, and even a $100,000 dollar bill?